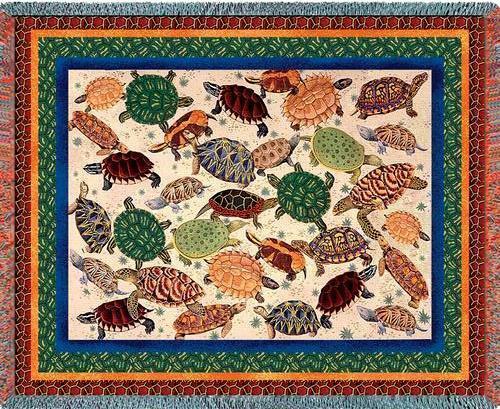 "Turtles Tapestry Throw" Surrounded by a rich blue, green, and yellow border, are turtles of all shapes and sizes and colors of the rainbow. With a detailed yet whimsical display of turtles, the artist appeals to the true lover of turtles. Cotton 100%. Measures 70" wide x 54" long. PLEASE NOTE: Shipping ONLY within the continental U.S. **Hawaii, Alaska, and Puerto Rico residents please contact seller for shipping quote before ordering.